With the bad taste washing away from Dawn of Justice, Civil War represents a chance for comic book fans to go back to enjoying a cinema trip. 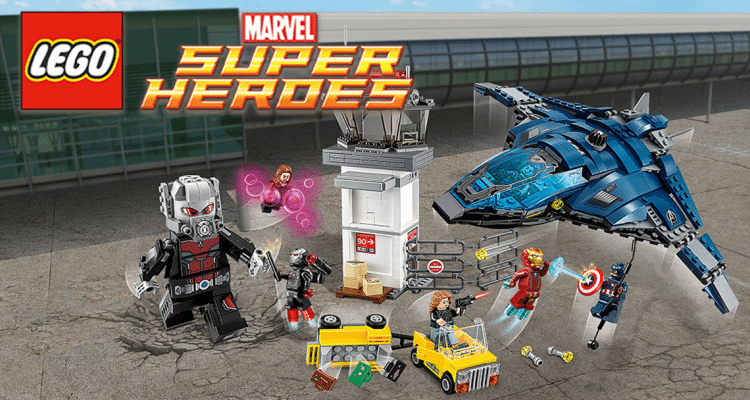 And for Lego enthusiasts, a new Marvel movie means new toy releases. With the film boasting a huge character line-up, as well as multiple scenarios and situations to choose from, coupled with the creative license employed at will, expectations were high even before the sets were revealed. And once they were, that expectation grew. 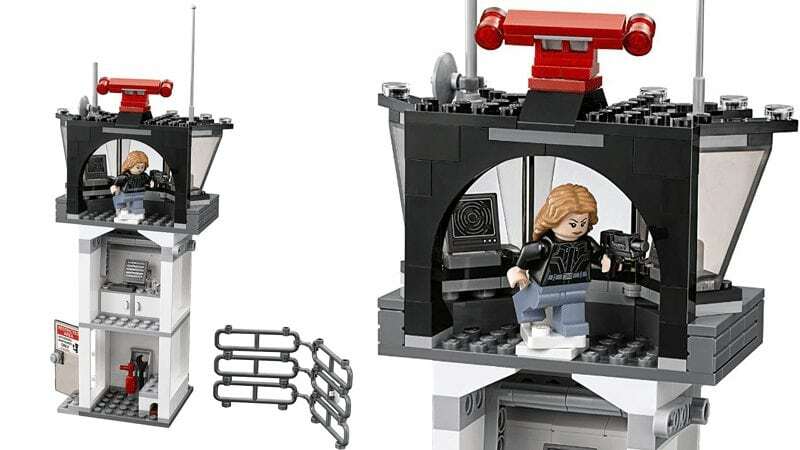 As not only would this set contain minifigs of major significance and meaning to the film’s plot, but there would also be the now-customary vehicle as well as what would appear to be a pretty big – nay, giant – spoiler for the movie itself. Where to start? Okay, let’s hold off on the main draw to this set and start with more-than-able supporting characters. We’ve said it before, and we’ll say it again when it comes to Lego and Lego collectors, exclusivity is key and always appreciated. So I find myself glad to report that the Aiport Battle contains four figures not used before. Whether they will remain exclusive to this set will only be answered when new sets are released in future, but for now, we have ourselves some exclusives. Starting with Iron Man, who here is presented in his Mark XLVI armour which has not been seen before. I have to say that the printing and design are excellent, as have been the previous Iron Man figures. Once again, the helmet comes in two interlocking parts, allowing for the faceplate to be hinged open to show off the double-sided Tony Stark headpiece. 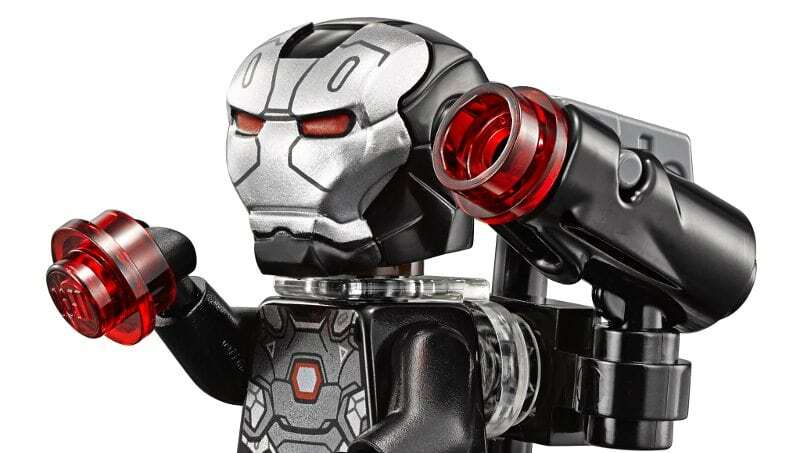 This appears to be the head that has been used in previous minifigs, but there can’t be too much cause to complain as you may decide to keep the helmet down anyway. Captain America is also inevitably included, given that he is Iron Man’s rival and all, though no exclusive figure, this time around. The design appears to have not been changed massively since the Age of Ultron sets, though the printing and design remain superb. We also get the Winter Soldier here and compared to previous outings for this figure, there have been some major changes made to the design. What is noticeable is that his metal left arm appears to now include a weathering look with battle damage and a faded red star, it is a nice touch. War Machine is a very nice inclusion. Here we get an entirely new costume design, coming in almost all black, save for a dash of red that compliments the design well. The printing covers the entire figure, and all of it works well and looks superb. Much like his ally, Iron Man, the helmet is made up of two pieces that can be flipped open. He also comes equipped with a rear-mounted shoulder cannon which can fire a stud. Scarlet Witch also gets an upgrade from her previous Lego appearance, this time coming with a much-improved design. The hairpiece looks a lot more in tune with her movie appearance. The torso has a new printing design also, with the jacket offering a much better representation of her movie counterpart. 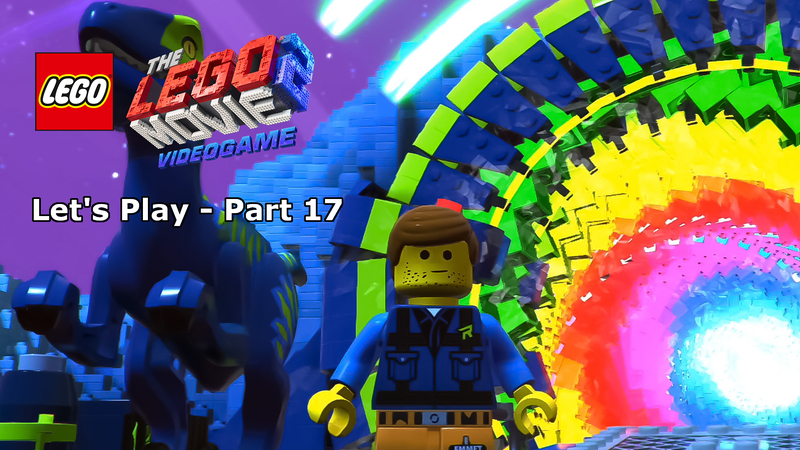 The double-sided head is the same as the one used previously, but this is not really anything new to Lego figures. 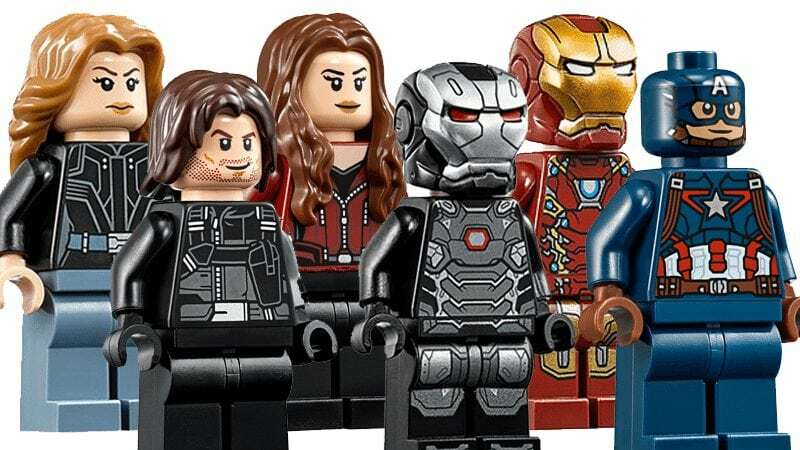 Agent 13 is a new character to the Marvel Cinematic Universe (her introduction in The Winter Soldier only gave us her name of Sharon), and she now makes her way to Lego sets. The figure is rather basic in design though it is faithful to the film version. The hairpiece looks good and the torso design is satisfactory. Okay, let’s get to the main attraction. Or at least, the first part of it. 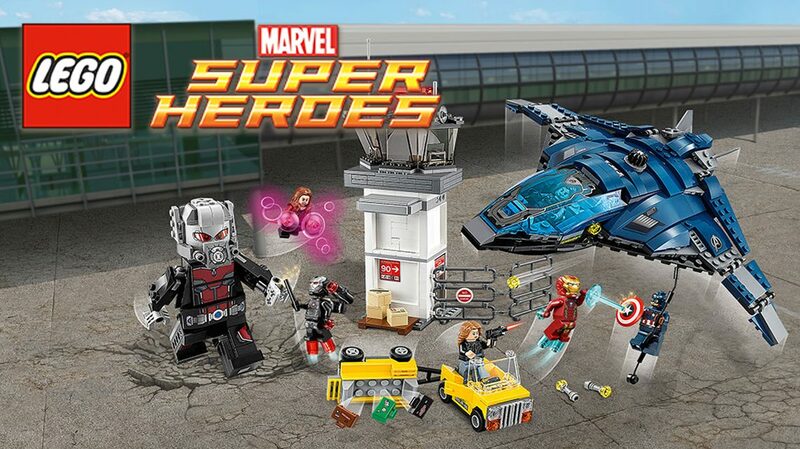 The mini-minifigure version of Ant-Man included here looks great. Considering its size, the printing is superb. There is no printing on the back though, given how great the overall piece is, I have no complaints. Now onto the highlight; Whether it ends up being a spoiler for Civil War or not remains to be seen, but for now all we can do is marvel (pun very much intended) at what Lego has put together here. As the main event of the set, the Giant Man figure invokes expectation and certainly does not disappoint. Quite simply, it is a stunning piece of design. It is the first large-scale figure of its kind and one that truly opens the door for Lego to explore new designs in future. I have to say, building the pieces together and watching as the finished product slowly come together is an absolute joy. There are a fair amount of stickers, and I have made my feelings known about their inclusion for some time, but on this occasion, I can’t bring myself to offer any gripes. I also noticed that the stickers appear to be thicker this time out. I don’t know if that is just a one-off, or that will become the standard moving forward. Its design is even more brilliant when the finished article is standing in front of you; it seems rather simple once it’s all finished, but the time and effort that has clearly gone into this whole design should be recognised and celebrated. The head, in particular, is good as it includes a newly printed piece used as the front of the helmet. Further to my comment a few moments ago, while I am not complaining about the use of stickers in this set, I was very happy to see that this new element was pre-printed. At the front of the helmet is the breathing apparatus, and this can be moved down to show the character’s mouth. Ball joints are used to attach the arms to the torso and therefore can be moved around more than you can do with a normal minifig. 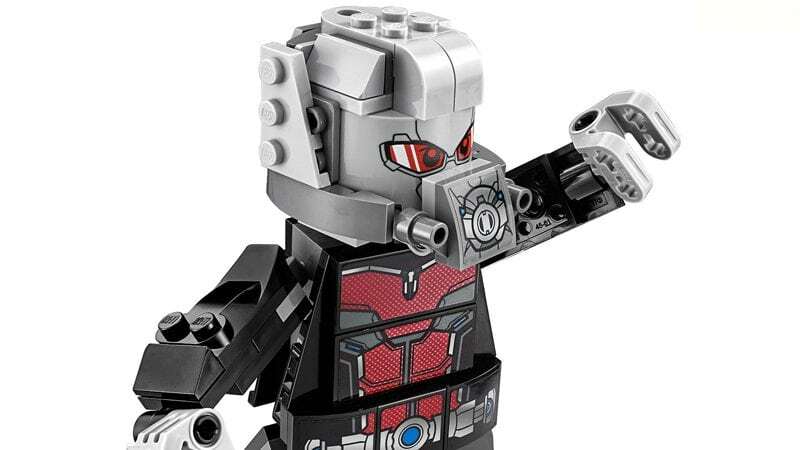 The inclusion of Ant-Man in the Cinematic Universe is going to be a major boon for Lego, as it has already led to two memorable figure pieces, and with a movie sequel already greenlit, there are sure to be many more. 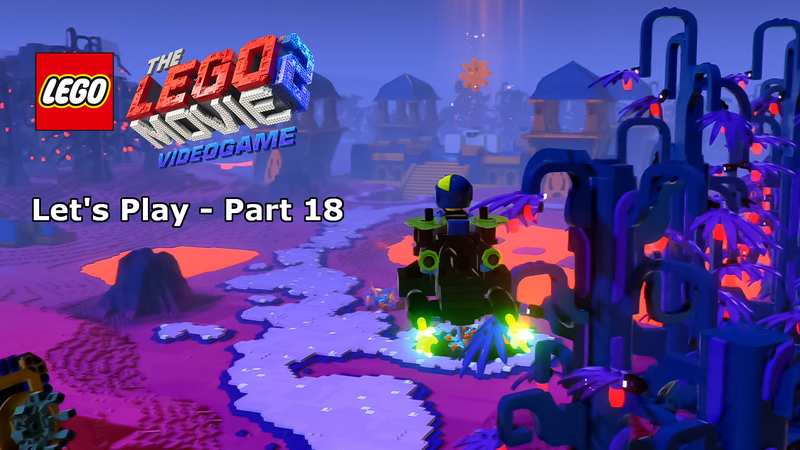 Before we get to the vehicles, let’s look first at the control tower. Not only does it look very good on the outside, but inside the detail is excellent and it has a host of features for the little ‘uns. My seven-year-old, for example, loved playing with this. For instance, pushing the Ant-Man nano figure into a small hole at the base of the tower will launch him into a pile of boxes, sending them flying. It works very well, and I can confirm – with the assistance of an enthusiastic seven-year-old – that the mechanism works just fine for playing kids. The second level of the tower contains a computer and cabinets, and a rather excellent play feature. A lever on the outside can be pushed down and results in the front wall coming apart, simulating the appearance of the wall exploding outwards. The two wall pieces easily slot back together again, ready for another collapse. One level up, the top floor sees three windows and a couple of computers. There is a chair for a minifigure and ore stickers in use here for the computer screens. A small complaint could be the lack of space inside the control tower though I get the feeling that space had to be sacrificed for detail. As a collector, I’ll take that trade. Moving onto the vehicles, we start with the baggage cart. It is easy to build though pretty solid once finished. 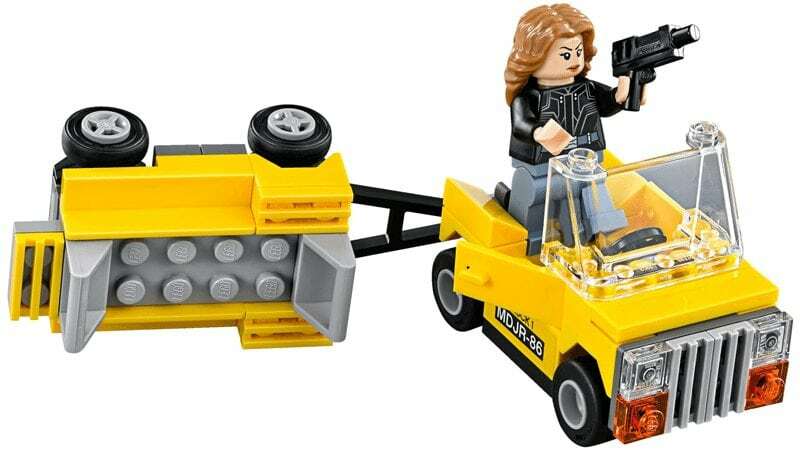 There is sufficient space for a driver – and Lego’s promotional material appears to have appointed Agent 13 in that position – and the three included suitcases in the back. I mentioned the playability aspect, and this is emphasised by the cart’s party trick; pushing down on a lever at the rear will catapult the luggage high into the air. 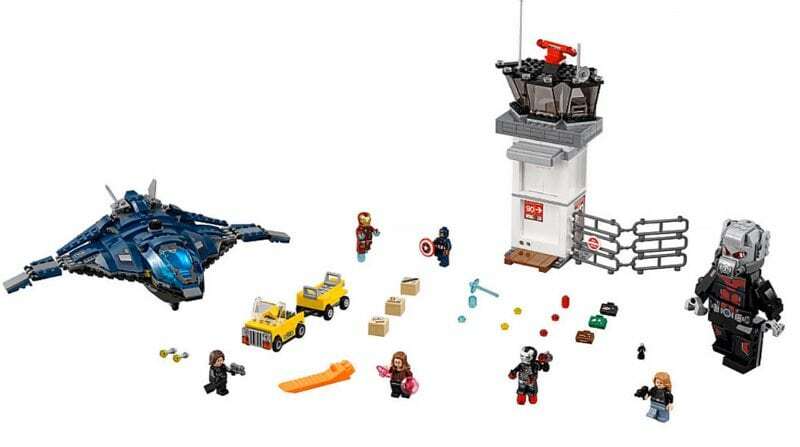 The Quinjet completes the set, and has become somewhat of a regular feature in Marvel sets in recent years. It has to be said though that this one is smaller than previous ones featured. I believe the size could be attributed to making it more available for smaller hands, or just to offer some variety to previous models, though that is only speculation. 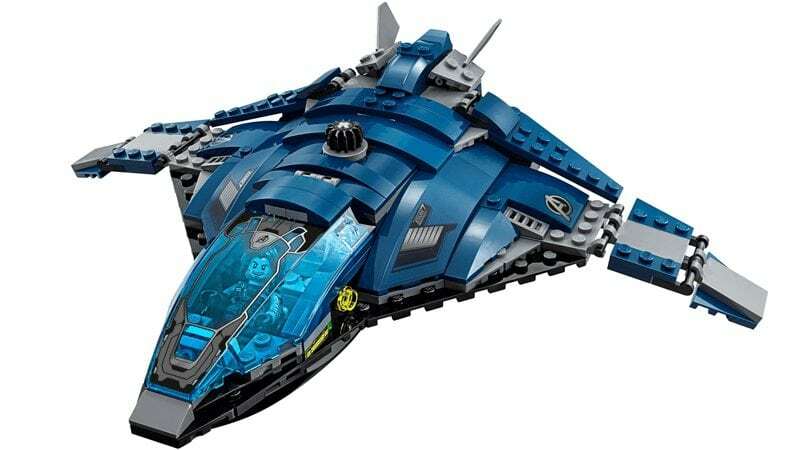 However, it is a good representation of the Quinjet and should do well to keep younger ages occupied. Inside the cockpit, you can sit two more figures though I did find that they have to be positioned just right to allow the hinged canopy to be closed fully. The canopy itself is adorned with a large sticker covering the whole front-top part, which would usually set my ‘sticker annoyance’ radar off, but again, it is hard to be critical with the overall presentation of the set. The build overall is very good and detailed, with a lot of work clearly going into this. What started as the most-anticipated of the new wave of Marvel sets ends as quite possibly the best Marvel set yet. 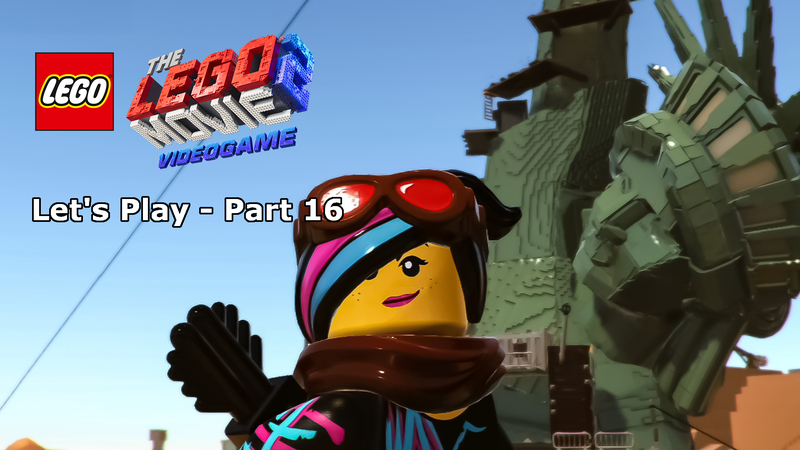 The minifigures alone offer great collector and play value, with the control tower and two vehicles acting as the icing on the Civil War cake, so to then also include the Giant Man figure seems almost like we are being spoiled. Yes, it’s not cheap, but when we’re talking about something this good, the price is not an issue. Some will question the price, but one look at what you get should provide a suitable answer. 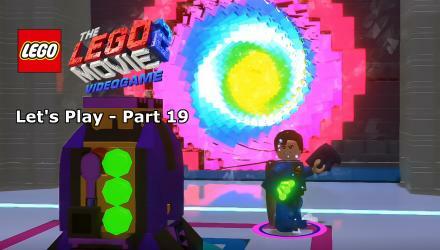 Offering six great minifigures, a first-of-its-kind giant figure and unique nanofigure, as well as heaps of play features for the kids, this set is up there with the very best. Don’t question the price, just buy this now. It’s worth every penny.